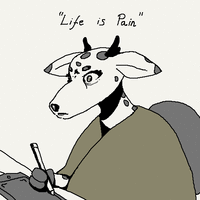 Deer is very depressed and lonely cervidae which is a shame because she seems rather charming or at the very least, is inoffensive (the latter of which is still better than certain other individuals). She lives in central Europe and has a strange fascination with wolf girls, which makes sense as even deer can be opportunistic carnivores. She also has a patreon, which you should donate to, if you like her quests and have the resources! This page was last edited on 20 April 2019, at 04:15.